Even after the end of the world‘s fair, the openair theatre has continued to be a focal point on the plaza. The diagonal positioning of the performing area asked for a round form that contrasts with the dominant angular forms on the plaza and also exploits the existing slope in the site. 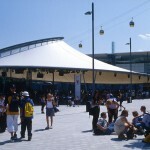 During the EXPO, performances by music and theatre groups from all around the world were held here daily. 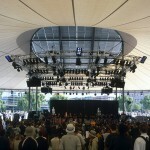 The 1900-square-metre roof offered audiences and performers protection from sun and rain. The spaces for performing artists (dressing rooms and toilets) are provided underneath the stage in containers inserted there. The stage can be used in two directions: diagonal towards the open central area of the plaza, or in the opposite direction towards the roofed, stepped area used for seating. While the membrane between the inner and outer rings diffuses the light, the stage is emphasised through the greater amount of light entering through inclined glazing that slopes to the north. For performances that require artificial lighting effects, the glass area can be blacked out by means of aluminium louvres. A ventilation joint between both roof areas extracts the heat produced by the lighting system or the entry of sunlight by means of natural thermal forces. 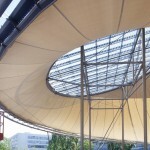 The roof membrane stretches between a compression ring with a diameter of 49 metres that is inclined from north to south, and a 16-metrediameter tension ring that slopes towards the north and rests above the performance area. 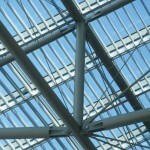 Tensioning the membrane (PTFE) creates a form that provides good acoustic conditions. The sheet steel gutter at the lower end of the membrane is separated from the compression tube by brackets that also carry cable conduits and the outer stage lighting. 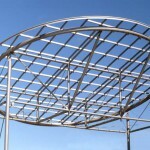 The trusses that carry the lighting and sound equipment above the stage consist entirely of standard, commercially available elements used in stage construction.